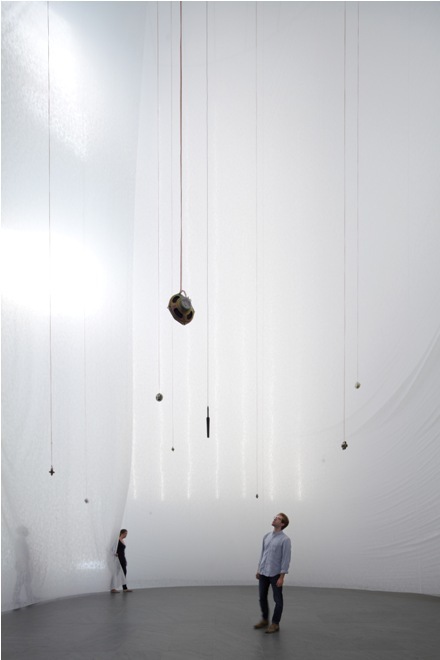 The Museum of Modern Art in New York (MoMA) presents Carlito Carvalhosa: Sum of Days, a large-scale interactive installation that engages the visitor’s visual, tactile and auditory senses. Brazilian artist Carlito Carvalhosa (born 1961) has suspended a lengthy, white, semi-transparent fabric from the spiral-like support attached to the ceiling of MoMA’s Donald B. and Catherine C. Marron Atrium, draping a nearly 20 meter tall stucture. 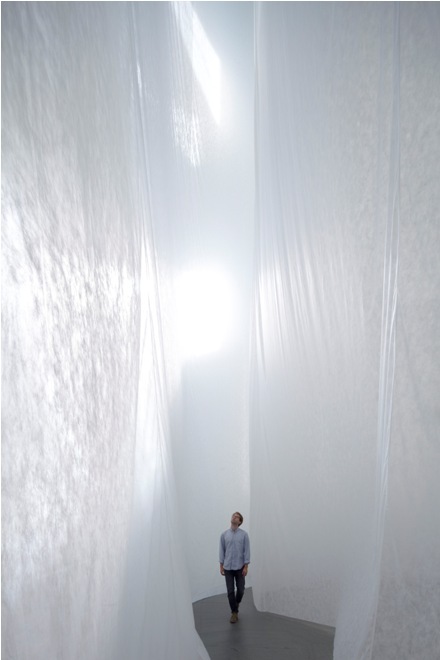 The fabric loosely touches the ground forming an elliptical walkway, the audience invited to walk through the installation and touch the fabric walls. 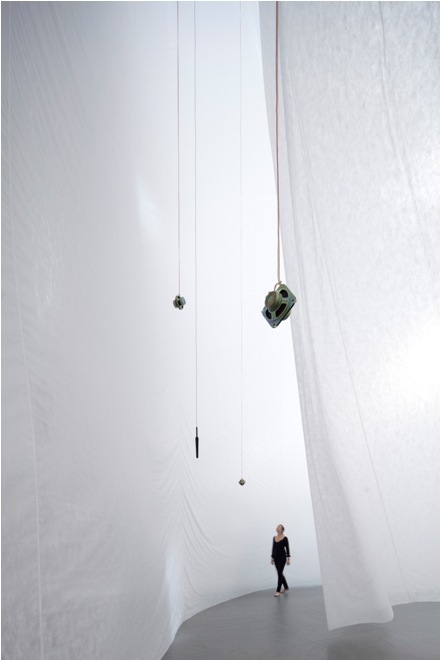 Ceiling-mounted microphones record each days’ background noises which are then played back the following day. This “accumulation” of sound through time is reflected through the title Sum of Days. The installation also includes the occasional live music performance. Curators working for the prominent Western museums are often concerned with the amount of information in explanatory wall texts and catalogs when interpreting art from formerly colonized and culturally marginalized countries, such as Brazil. Within this context, detailed and long wall text may obscure aesthetic qualities of displayed art and distract the visitors. Conversely, leaving out the socio-cultural dimension of the work of art may challenge the educational purpose of museums. Curators Luis Pérez-Oramas and Geaninne Gutiérrez-Guimarães thoughtfully balance out the informative and the aesthetic aspects in the Sum of Days exhibition. The information provided on the Atrium wall label offers a detailed description of the Sum of Days. In addition, it mentions the Brazilian avant-garde tradition of “relational sculptures made of soft fabric… intended to be handled or worn as [seen] in some works by Lygia Clark and Hélio Oiticica.” Stemming from this art practice, the wall label informs that the “Sum of Days brings a new level of meaning to this legacy by realizing it on an architectural scale.” However, the wall text does not inform about the contributions of Brazilian avant-garde from the 1960’s and 1970’s, specifically Clark and Oiticica, to distinguish authentic Brazilian culture from European cultural dominance. By using the same means as the European avant-garde—mainly abstraction and geometry—but emphasizing the interactive aspect of their installations, the Brazilians underlined the political dimension of the discrepancy between the mainstream and marginalized art. Yet the curators have chosen not to include such contextual background in the wall text, leaving out any overt political overtones to Carvalhosa’s Sum of Days, avoiding the possible denouncement of Brazil as a cultural periphery. However, in order to comply with the educational component of MoMA’s mission, Pérez-Oramas and Gutiérrez-Guimarães perhaps could have incorporated at least one scholarly text in the exhibition catalog contextualizing Carvalhosa’s art within the tradition of Brazilian modern art. Instead, the catalog, edited by Carvalhosa himself presents an overview of the last ten years of his career without focusing on the Sum of Days. 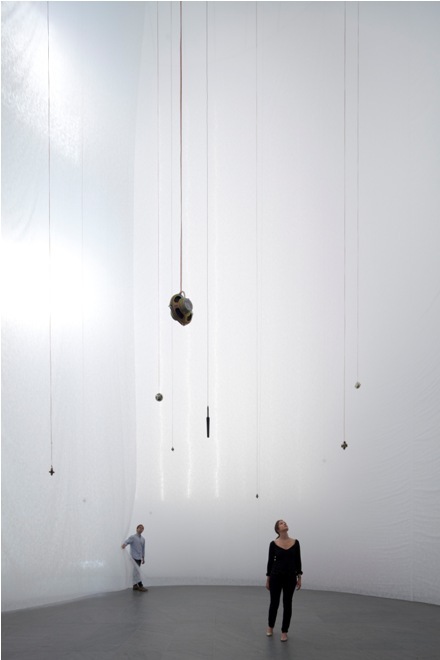 In the short catalog essay on this installation, the Brazilian curator Ivo Mesquita placed the Sum of Days (when exhibited in Sao Paulo) as a meditative, spiritual, private space for contemplation. The lack of analytical writings on Carvalhosa in the catalog does not seem to “help understand” the context of the Sum of Days. However, the curators did help the visitors to focus on the piece by reducing the amount of information in the wall text. If the curators offered more information in the catalog about what really means to be a Brazilian artist nowadays, the visitors would be offered a choice to better understand the Sum of Days in addition to enjoying its formal qualities. This entry was posted on Friday, September 9th, 2011 at 12:19 pm	and is filed under Art News, Go See. You can follow any responses to this entry through the RSS 2.0 feed. You can leave a response, or trackback from your own site.